Puffy eyebags can be a major beauty problem. People often associate eyebags with lack of sleep and stress. It can also make you look 10 years older. As we age, the gravitational pull of the earth takes a toll on our skin. Since the skin around the eyes is thin and delicate, it loses its elasticity and is likely to sag first. It is therefore important that eye care should be part of your regular beauty regimen. 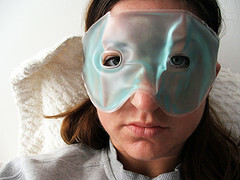 After all, there are many cheap and affordable ways to get rid of nasty eyebags. What’s good is that most of them can be found at home. Cut two slices of chilled potato. Put one each over closed eyes and let it stay for 15 to 20 minutes. Potato contains anti-inflammatory starch that can help reduce the swelling and puffiness around the eyes. Sliced cucumbers are very popular remedies for puffy eyebags. Just like potatoes, cucumbers work best by refrigerating them first before using them. Put a slice over each closed eye and let it stay until it gets warm. Cucumbers contain astringent properties that helps constrict blood vessels around the eyes. Chilled tea bags also help relieve puffiness around the eyes. Black and green tea bags are both good for puffy eyes because they contain caffeine which helps reduce swelling. For tired, irritated and red eyes, go for chamomile tea bags. There are actually two ways to apply tea bags. One is to steep it in hot water, let it warm, then apply over eyes. Another way is to put it in the fridge before applying it. Egg whites do not actually get rid of puffy eyes. However, applying it under the eyes and letting it stay for 15 to 20 minutes will help keep the skin tight. It can somehow make the skin appear less puffy. One reason for puffy eyes is dehydration. If our body is dehydrated, it tends to retain fluid as a defense. Dehydration is aggravated by alcohol and increased salt intake. So, if you want less puffy eyes, drink plenty of water, but avoid doing so two to three hours before bedtime. Light strokes and gentle massage can help drain fluids, especially under the eyes. Just close your eyes and do some light, tapping motion with your fingers around the eyes. Move from the inside of the eye outwards. Repeat 10 to 15 times for each eye. The best way to combat eyebags is to sleep at least eight hours everyday. However, be mindful of your sleeping position. Always sleep with your head elevated. Avoid sleeping on your side for too long or on your stomach, especially with your face pressed into the pillows. Being stuck in these positions can cause fluid to stay under the eyes, thus, causing puffy eyebags. Cheap, right? Some of these tips can even be done at no cost at all. You don’t need to splurge on eye creams and serums. Sometimes, all it takes is not to neglect our pretty peepers and be mindful of how we use (or abuse) it.